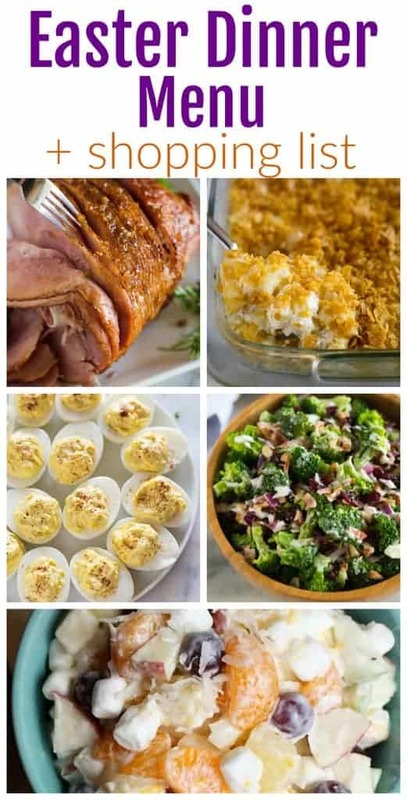 This Easter Dinner Menu includes my absolute favorite Easter recipes, a grocery shopping list, and tips for how to make Easter dinner ahead of time! If you want to choose different Easter recipes, browse all of my Easter recipes and create your own meal plan and shopping list using my Custom Meal Plan feature. One of my main goals with my website is to help make your life easier when it comes to cooking for your family, hosting dinner, or just being more comfortable in the kitchen. I’ve created this Easter Meal Plan with the hope that you can spend more time with your family on Easter, and less time in the kitchen! I’m offering a free grocery shopping list, and tips for making your Easter dinner ahead of time, so that everything comes together on time, without stress! What food do you eat on Easter Sunday? Ham, chicken, and lamb are all thought of as traditional easter dinner items. At our house, we always had a delicious baked ham for Easter dinner. The menu items I have selected below are all traditional Easter Dinner Menu items that I grew up eating on Easter Sunday with my family. We often ate “Easter Dinner” around lunchtime, just following our Sunday worship. This is an Easter menu that can be served for Easter lunch or Easter dinner. Below is a fairly traditional Easter menu consisting of ham, cheesy potatoes, deviled eggs, fruit salad, and broccoli salad. While we all want to enjoy a nice Easter dinner, no one wants to spend the entire holiday in the kitchen cooking! I chose this menu very purposefully to help you enjoy Easter dinner with your family while still preparing a feast your guests will love! Prep the broccoli salad. Cut and blanch your broccoli florets, cook and slice 8 slices of bacon, chop your red onion and almonds, and prepare the dressing. Store the broccoli, bacon, red onion, almonds, and dressing each in separate containers in the refrigerator. Make the Deviled Eggs. Prepare them as stated in the directions and store them covered with plastic wrap or in a covered container in the refrigerator! They will stay fresh until Easter dinner. Make the Cheesy Potatoes. To make the potatoes in advance make the recipe through step 4 (when the mixture is spread into a 9×13 inch baking dish). Store the baking dish, covered, in the fridge until Easter Sunday. Make Creamy Fruit Salad. This should take just 10-15 minutes to throw together and needs to sit in the fridge for about 4 hours before serving. Combine all Broccoli Salad ingredients. In a large bowl combine the broccoli, bacon, red onion, almonds, cranberries, and dressing. Cover and store in the refrigerator until ready to serve. Take the Ham out of the fridge. Allow the ham to come to room temperature, which could take about 1-2 hours. Doing so will make for a quicker warming time in the oven, which will ensure your ham doesn’t dry out. Make the Ham Glaze. Combine all the ingredients in a saucepan and stir until smooth. Reduce heat to low and simmer until thickened, with a syrup consistency. Bake the Ham. Place the ham in a foil-lined roasting pan or deep baking dish. Brush a little of the glaze all over the outside of the ham. Cover it well with foil and bake at 300 degrees. Bake the Cheesy Potatoes. Crush 2 cups of cornflakes cereal (I pour them in a ziplock bag and use my hands to crush them). Mix 4 tablespoons of melted butter with the cornflakes and sprinkle the mixture over the potatoes. Bake funeral potatoes in the oven for 40-50 minutes (you may need to cook them 10 minutes longer if they came straight out of the fridge) or until it’s bubbly and warmed through. If you are dealing with one oven, cook the funeral potatoes and ham at the same time. Adjust the temperature to 350 degrees and put both the funeral potatoes and ham in the oven. When the funeral potatoes are finished, check on the ham. The goal with the ham is to heat it up (it will likely need a little longer than the potatoes). If the ham is warm when potatoes are done cooking, add the glaze to the ham and return it to the oven at 400 degrees for 15 minutes! I’ve just found your site. I’m going to use some of your recipes and your plan ahead ideas for Easter dinner. I cook ok, but I usually feel so flustered, I’m happy to have a plan someone else has already figured out! I’m so happy I could help! I hope you have a wonderful Easter dinner!